Former Atlantic League hurlers seem to be making news in many ways of late. Scott Kazmir (Sugar Land) deservedly is at the top of this group since the talented lefty has been awarded the start for Houston in Game 2 of the American League Division Series against Kansas City Friday. Free agency seems to be the next step for another southpaw, Rich Hill, who went from two starts with Long Island in August to four outings for Boston a few weeks later and came away with a 2-1, 1.55 record with a 0.66 WHIP and 36 strikeouts in 29 innings while facing each of the Red Sox's American League East opponents. The success of the 35-year-old Hill should not serve as anything but encouragement to Jarrett Grube, a right-hander who pitched at Southern Maryland in 2009-10 and turns 34 next month but has only one major league game (Los Angeles Angels) to his credit. He pitched in Mexico until June, and has just finished a 9-0, 2.26 run with Cleveland's top farm club in Columbus, OH, as the Clippers won the International League championship. 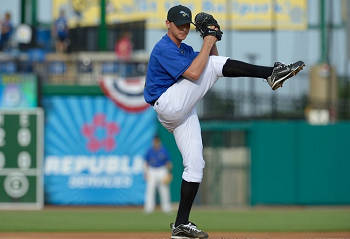 Grube has been invited to pitch for Team USA in a 12-nation tourney in Japan during November.